The Fort Bragg Unified School District is reconnecting young people with their local food sources through their daily school lunch program. From nutritious proteins to leafy greens, the key ingredients for a healthy school lunch are at their best when they’re local. To make this a reality, some forward-thinking schools are breaking away from the norm of large-scale suppliers and re-connecting with their local providers. In Fort Bragg, students and staff are enjoying the benefits of these efforts in the local public schools. Since 2006, the Fort Bragg Unified School District has worked with the Noyo Food Forest to provide vegetables and leafy greens for the high school. In 2014, the High School and Middle School were inaugural members of Fish To Fork, a program managed by the Fort Bragg Groundfish Association with grant funding from the National Fish and Wildlife Foundation, supporting community access to local seafood. 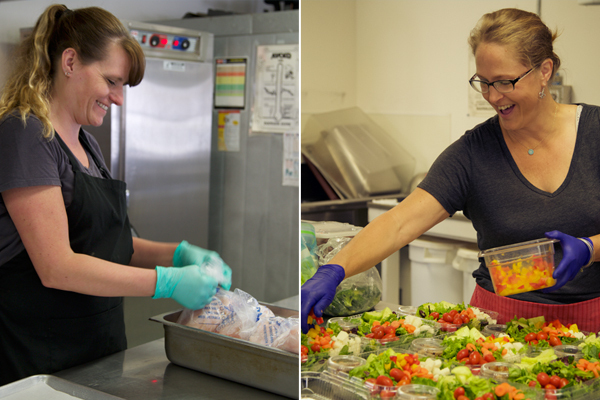 Today, thanks to supportive communities, forward-thinking kitchen teams, and conscientious students, these efforts are catching on… The seasonal salads are now a daily staple and a favorite choice amongst students and staff in the High School cafeteria. 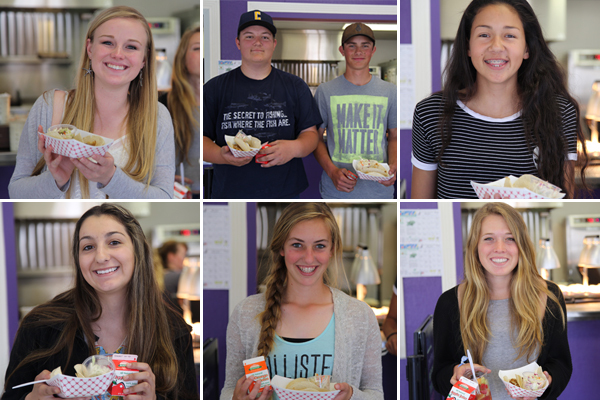 The monthly local fish lunches are serving up fish and chips, fish tacos, and fish sandwiches in both the High School and Middle School. 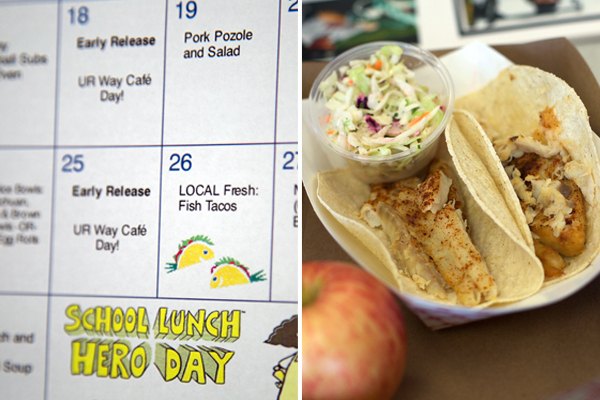 On a recent Friday, the Fort Bragg High School was serving up fresh fish tacos – topped with a spicy cilantro-jalapeno slaw. Each fillet was baked with a housemade chile-cumin seasoning and served in corn tortillas, ready for hungry students to enjoy. A group of students trying the local fish lunch for the first time were in agreement: “Pretty amazing!” Heads nodded around the table between bites. “I really like that it’s local, and not canned or processed, or from Alaska or someplace,” said Justin Celeri, a junior at Fort Bragg High School. The fish being served was Arrowtooth flounder – a local species of groundfish. It was caught by the F/V Donna J, a Fort Bragg fishing boat run by Captain Charlie Price. The catch was processed in Noyo Harbor, just three miles from school, and delivered directly by Caito Fisheries. Word is still spreading about the local fish lunches – but upon hearing about the program, it is an easy sell for this community with deep roots in local fisheries. Many students have firsthand experience with fishing in the Fort Bragg community. “I fish for fun, and we eat fish at home a lot,” said Natallea Bazar, a sophomore at Fort Bragg High School. Even at a young age, they are selective about where their food comes from, and are particularly choosy about their seafood. Most agreed that they rarely order fish when eating out unless they know its source. “When I eat fish at home, it’s all caught by my dad. 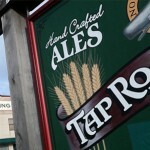 We pretty much never buy it out or at the market,” said Cassidy Daniels, a senior at Fort Bragg High School. Learning that the school cafeteria was receiving fish directly from Noyo Harbor was exciting news. “When is this happening again?” asked Victoria Yanez, a senior at Fort Bragg High School. 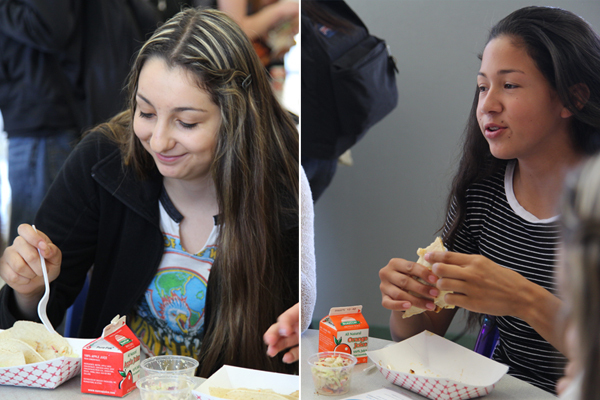 In Fall 2016, the Fish to Fork program plans to begin its third year in the Fort Bragg schools. With go-to recipes and routine deliveries in place, the preparations for these local fish lunches are “hardly any different from our usual prep,” according to members of the high school kitchen staff.The recipes are developed and tested by the kitchen staff themselves. 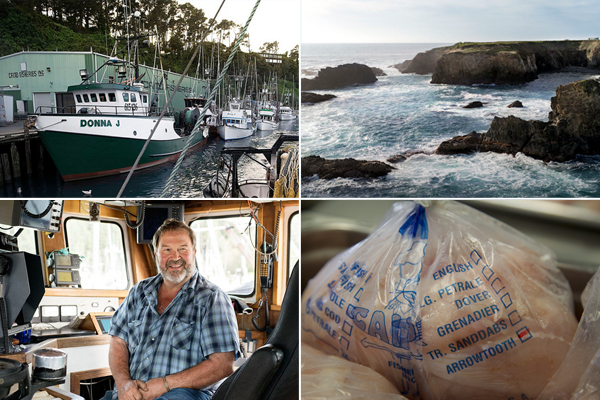 The monthly delivery of locally-caught and -processed fish are delivered by Caito Fisheries in Noyo Harbor, in partnership with the Fort Bragg Groundfish Association. As a way to connect young people to fresh, local, and flavorful foods, these programs are relatively simple, yet highly effective. The Mendocino Unified School District is also making strides to source locally. 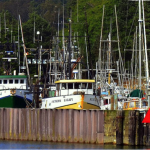 The Fort Fort Bragg Groundfish Association is in contact with administrators at MUSD about bringing the Fish To Fork program for local fish in the upcoming school year. To learn more about the Fort Bragg fisheries and the Fish To Fork program, visit FBGACA.org or connect on Facebook at facebook.com/fortbragggroundfish. 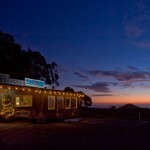 Photos by TrimTab Media and Corey Arnold.